On the very top of Santorini's famous cliffs, with a great view to the Caldera Sea Lake, the volcano and the world famous Santorini's sunset stands the hotel VILLA RENOS. One of the first hotels of our island is ready to welcome you after our last renovation during the winter of 2003, where we upgraded to a 4 star accommodation. Built with care and atention to detail, retaining the traditional beauty of the island. The interior has been decorated with handmade furniture chosen with love from the owners Petro, Zina and Vassili Mateka. Our rooms provide all the necessary and modern comforts for a pleasurable stay. Especially for our demanding quests our rooms provide seperate telephone line with internet access. The large balconies of the rooms with the view to the sunset, our renowned hospitality, the friendly homey enviroment, the exceptional tasteful homemade and ecological breakfast, the shared outdoor jacuzzi for 6 people facing the sunset and our fitness center will make you feel at home. Besides an unforgettable stay at the hotel, HOTEL VILLA RENOS coordinates traditional weddings. day extraordinary and memorable as your will be exchanging vows against the magnificent sunset of Santorini. Weddings are always held with our islands time-honored traditions. 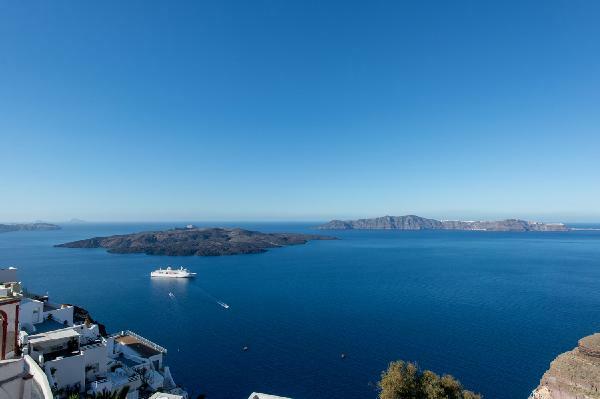 Civil marriages are held at the hotel when the sun is setting into deep blue waters of Santorini. Church weddings are performed at the island's Cathedral, which is nearby our hotel. (Or you can choose any other church on the island you want). COME TO OUR ISLAND AND LET US ORCHESTRATE YOUR WEDDING IN A UNIQUE AND REMARKABLE AWAY. All the rooms of Hotel VILLA RENOS are having very big balconies facing to the Famous Sunset of Santorini and the volcano. Both Standard doubles and Double deluxe are equipped with air-conditions (cold/hot), direct digital phone lines, internet sockets for your laptop, refrigerators, mini bar, satellite TV, safe boxes, coffee-tea makers, bath tabs and hairdryers. 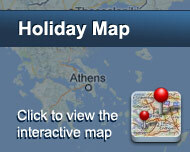 The deluxe rooms except of all the above facilities are having also indoor or outdoor private Jacuzzi's. For the most demanding customers hotel VILLA RENOS also offers : fax services and internet access, laundry-pressing, bike and car rental services, currency exchange, room service menu with our traditional plates, massage and shiatsu service and beach towels. Είστε ιδιοκτήτης ή διευθυντής στο VILLA RENOS; Εγγραφείτε τώρα για δωρεάν εργαλεία, που μπορείτε να χρησιμοποιήσετε για να βελτιώσετε την καταχώρησή σας και να συνδέσετε την ιστοσελίδα σας και το σύστημα κρατήσεών σας.